Welcome to Bunny.nu » Blog Archive » Snow! This is how we feel today – well, to be quite honest, we “only” got about 10 inches of snow yesterday (in some places in south of Sweden they got over 20 inches) but we already had a lot of snow so trying to clear the driveway and the cars of the newfallen snow is hard work. 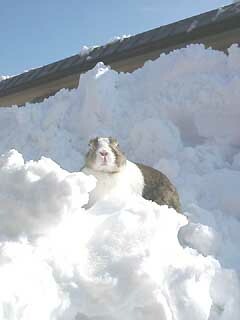 The picture shows one of our favourite bunnies: Oolong who lived in Japan. This entry was posted on Sunday, February 21st, 2010 at 2:21 pm	and is filed under Bunnies. You can follow any responses to this entry through the RSS 2.0 feed. You can leave a response, or trackback from your own site. Oolong sure looks like a conqueror where he sits on the top of a mountain of snow! OOoo boy – we have not had snow this winter! Last year was enough for a good long time! Take a break now and then from shoveling!